Re: A 969 rebuild from Downunder. I have been busy, with mixed results. After couple of false starts, I managed to test fit the Holmes cranes to the Glorifier. It was a wet day but I was keen. We dealt with dodging scattered showers and muddy ground. The Kenworth is a surprisingly poor performer on wet ground, it didn't want to steer much, even in 6WD. Anyway, a few things had to happen first. The Bolster bolts didn't seat properly . . . .
. . . so there was some careful material removal to find a good fit without weakening the fittings. All good. And, of course, all the other bolts for the job. Firstly, pull the cranes out of the way so that the Glorifier can be positioned for fitting the cranes. Then the tricky bit. . . .
. . . which led me to believe that the cranes should be fitted before the rear body is fitted to the chassis. I had to remove the Holmes control levers to squeeze the cranes in between the rear of the cabin and the front edge of the rear body. Then fit all the Bolster parts to check for correct alignment. There are a couple of problems, but all considered, it went together fairly well. 1942 Script GPW (Daily driver). 2 x Diamond T 969.
. . . continuing . . . . The main problem was the length of the tie plates. 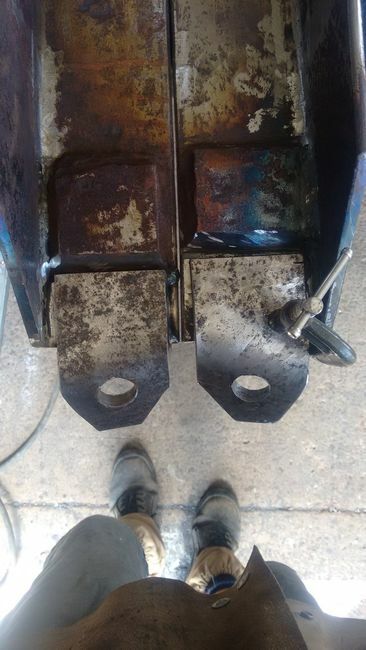 Despite being drilled using a rusty original as a template, they were 3/8" (10mm) too long. So I elongated the holes. Firstly, mark them out . . . .
. . . and drilled to remove the bulk of the material and create a weakness line which allowed me to use a round point cold chisel, and holding the plate closely in the vice, I could chisel out the bulk of the remaining material . . . .
. . . . and finish with my trusty die-grinder. Not quite the right picture, but you get the idea. Another problem was the airline above the inner air tank, which is a bit squeezed under the crane frame. I hope to 'clock' the tank a bit to create some clearance there. A third problem is that I may have assembled the drive chain adjuster backwards. That may need all the control linkages to be removed to fix. I hope not. When the cranes are fitted to stay, the Glorifier will no longer fit in the workshop, but will need to be stored in a parking bay under the back of the house. But this parking bay does not have doors, and faces the prevailing direction the rain comes from. So, another job is to build some doors (3200mm x 1400mm x 2) to protect the truck from the weather. One more job to do. Two other problems need addressing. The first one I have known about for a long time, being the failure of the front springs shackle rubbers. These were NOS rubbers that are clearly way too soft. I have a couple of ideas what to do about it, but am open to others' experience. What has your experience been with these bushes? The second problem is unexpected and much more troublesome. I removed the front tailshaft yesterday to have the spline renewed. To my dismay, I saw that the drive shaft and the diff housing have been hitting the sump!!! At this stage, I can only see the option of removing of the sump and cutting/welding it for an additional 1 1/2"(40mm) clearance. A big and unwelcome job. Working in Carnarvon W.A. in the late 60's early 70's it was common practice to use Delrin type products for HD spring mountings on the old retired Ansett Flxible Clippers. These old buses were used to transport staff long distances to the Lake MacLeod salt mine/flats over rutted dirt roads 7 days a week. Held up well. OK, that has given me a good starting point. Tom Warren (Diamond T rubber products in Armrilo Texas) has new made front shackle bushings in stock. 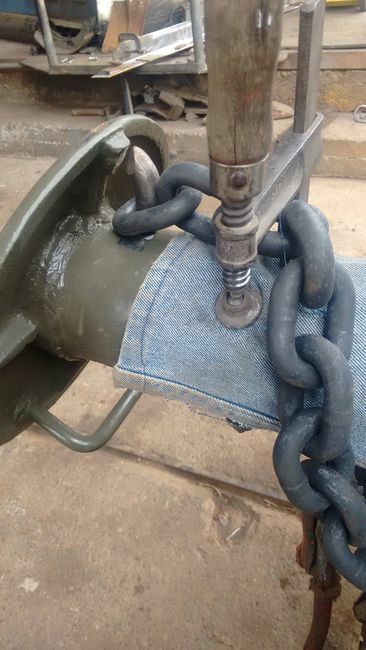 I spent a bit of time playing with the shackle bushes. They had failed from just sitting doing almost nothing. Fortunately, I had kept the bushes that I had removed from the truck years ago. So I wanted to try a different idea. In the picture below, at left is the 'new' bush I removed today and at right is the bush I removed years ago. The newer bush is clearly more damaged than the older bush. So, I re-fitted the old bush, but rotated 180deg, such that the distorting action of 'in service' would tend to force the bush back into shape, and at the same time look correctly positioned from the outside. And that is what happened. I haven't driven it yet, but an interesting experiment nonetheless. You can see that the bolt is slightly off centre, but think about it, it is off centre opposite to what you'd expect to see 'in service'. I will be watching them closely to see how well they hold up with some use. 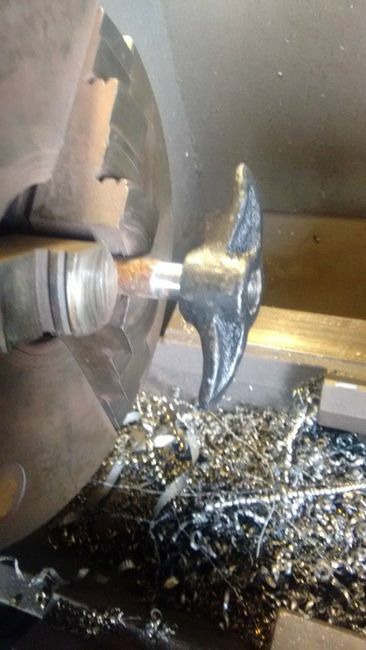 The jack that can be seen is not taking any weight in this picture. Another problem which I have found before is a castellated nut/drilled bolt that don't align. So for one bolt, I had to extend the slot to get the split pin into place. Other pictures I think I've missed previously . . . . . . The bolster legs repaired ready to have their brackets welded into place. And machining the outrigger leg pin shaft to take the unco-operative handle. I removed the Holmes transmission drive sprocket from the Homebush truck to use as a sample as I cannot find the one I removed from the Glorifier. It is an 18 tooth, 3/4" pitch, 1/4" keyed, 3/8" grub screwed sprocket, with, surprisingly a 30mm hole!!! Yes, the input shaft is metric!!!! Also surprisingly, I managed to buy one (not a Holmes one) at the local engineering works, the only one they had, old stock. Yeah! I see the Austrailan flag made it into a picture! I bet you had fun putting the U bolts thru the A frame back thru the bed and the 2 frame members. The crane frame was installed before the bed during the assembly process. However, you made it work just like when you repaired the inter diff on your Kenworth! Yes, the U-bolts look like they were designed by a committee!! They both have to be fed into the triangular lower frame, called the 'Bolster', and then lowered through each of the floor 'block's, then the 'tie plate's and into the floor. Further, the Bolster has to be horizontal or the U bolts held at an angle to put then together, THEN the bolster is tipped up at its' angle to seat on the floor blocks. I wish I had 4 hands!!! Another job was related to buying wire rope for the Holmes W45 winches. Being a metric country, it is very difficult to buy imperial wire rope here. So after quite a bit of looking, I went with 13mm rope. That is 0.3mm (0.012") oversize. The only real issue is how well the original splice eliminators will work, more on that when the time comes. Anyway, the rope is ordered and in preparation for its' arrival, I repaired he original Holmes hand crank. I only have one and it is in poor condition, bent and cracked. I vee-ed out the cracks . . .
. . . pressed the socket end straight(er ) . . . .
. . . welded them, easily done as the crank is cast steel. Preheating gives a better weld, I'm told. Then, I used some heat to straighten the crank. That did not work very well. To my annoyance, the web did not stretch much, but cracked under tension. I thought the steel was more malleable than that. Maybe I should have done the straightening cold, or less than red hot. I dunno. Anyway, that meant I had another three cracks to weld up, and that is where I am up to now. Hope to finish that today. Another two pictures overlooked previously, I think . 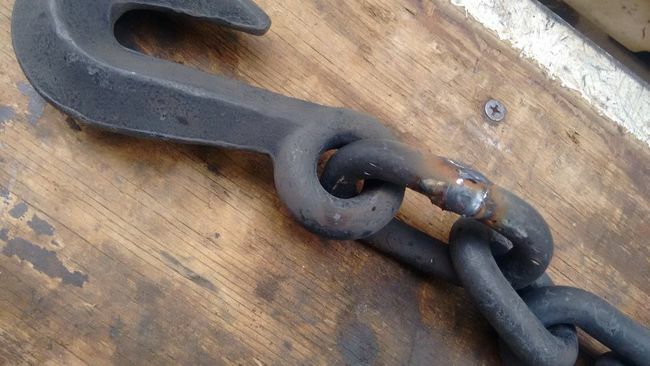 . .
Welding the chain to the outrigger leg. Actually, welding the loop that attaches the chain. It was originally cast into the foot in one piece and welded when the foot was welded to the leg. I used a convenient sized chain link. And attaching the hook to the chain. I have no clue whether there will be strong bidding for the cranes, or they will be passed in. I certainly would not let them go to scrap. Is there anyone going to that auction? It is a long way (1000kms+) from me. The Diamond T looks to have very good sheet metal, maybe an excellent restoration project. No rust to be seen and very very straight for an unrestored truck. "[will go to scrap]" . . . is this opinion or do you know something? Just curious. Sam wrote: "[will go to scrap]" . . . is this opinion or do you know something? Except a 'crazy' like me! Life is busy and exciting. I'm on holidays now, so plenty of Glorifier time is happening. After some searching, I had to settle with 13mm wire rope as I couldn't get 1/2" wire rope here in Australia. The main concern is whether the slightly (0.3mm) larger rope would work in the original splice eliminators. I bought a single 120m length . . . .
. . . ran it out in a grassy paddock to cut it in half. I ended up with 60.9m lengths. The original 200' is 61.15m, close enough for me. Then, using my recently repaired hand crank lever, I wound the wire rope onto the winch drums. The hand crank is on the luffing winch in this picture. The outrigger leg has to be moved out a long way to be out of the way of the hand crank lever. Next was fitting the hooks. Here is a TM picture of the "safe-line" splice eliminator, I was looking for how the TM advised to fit them. No help, it simply stated the obvious! So once again, I wrestled with the rope, trying to position the clamp as close to the eye as possible. The design of the clamp seems to prohibit the neat fitting of it. But constraining the rope helps a lot. The problem is that wherever the lower nut is when it is started on the thread is about 3/4" lower than it will end up, as it moves up the clamp as it is tightened. I have no clue how they managed it in the TM picture above. This is as good as I could get it. It engages the slightly oversize rope convincingly, and this will have to do for now. I had run out of reasons to delay the fitting of the cranes to the chassis. So I picked up the cranes and moved them out of the way, here they weigh 1 1/4tons, see the crane scales on the hook. . . .
. . . while the Glorifier waited its' turn to be positioned. . . .
. . . . so that we could position the cranes in their place. This worked well, having removed the control handles to give more space to wriggle the frame into position. Then came the surprisingly difficult job of bolting it down and fitting the bolster and all its' bits. I wanted to put the lower stiff arm bolts in from the top to show the large square heads. But there was zero clearance to get a decent spanner on the 1 7/8" nuts to tighten them properly. So I had to do some dis-assembling to allow me to put them in from underneath such that I could get a socket on them from the top to tighten them properly. In this picture, the bolster and stiff arms are propped up with a piece of timber to be able to fit those bolts. The next difficulty was the U bolt nuts that go inside the chassis rail, above the diffs. And are so close to the rivets that I had to modify the washers to get them on. While I'm squeezed between the driveshaft, brake actuator and some hoses. You'll forgive me that I didn't photograph that. Phew, I'm very glad that is done. Now for a little sit down and rest. Today, I had hoped to fix the W45 drive chain tensioner and fit the control levers and linkages. How difficult could that be? Well . . . . . . . very. I had fitted the drive chain tensioner according to the parts manual, i.e. on the drivers side of the chain. Once the chain was fitted and I powered it up I could see which way it was turning. Yes, I could have done that before, but I wasn't being that clever! My experience tells me that the tensioner should be on the non-drive side of the chain, i.e. the passengers side. So I was glad to see it like that in the TM. The tensioner is mounted on a sliding length of channel that is behind the control lever linkages. So, yes, most of the control linkages had to be removed to get the tensioner out to turn it around. The tensioner is mounted off center on the sliding channel and it would not side far enough to go on the other side of the chain. And as most of the crane parts are fitted, nothing is easy to get at. So it had to be mostly dis-assembled to be fitted correctly, then all the control linkages re-fitted. So the tensioner is correctly fitted and adjusted now. Then came the assembly of the control linkages. Well, Ladies and Gentlemen, THAT was a lesson in 'combinations and permutations'! The number of different ways those brackets and levers would go together but not work was truly surprising. One bracket/handle would go on fine, but there was not enough room, just, for the next one. It would only work in a certain way. This is the only picture that I could find quickly. It shows the two handles at the same position vertically, with the top rod bracket mounted downward and the lower rod bracket mounted upward. "Z" is one of the brackets. So after a LOT of backwards and forwards, I managed to get it together so that it works. And so I powered up the transmission and tested the winch drives with the drums dis-engaged. All good, I was glad to be able to spread some oil around inside the transmission housing! The throttle linkage that runs forward to the gearbox bracket has been fitted and tested. It works well. Here is the drum of wire rope, loosely fitted. Now that the winches are connected to their drive, I can run the rope off and wind it on correctly and learn how to use the cranes at the same time. Another job, not yet quite finished, is 'finishing' all the split pins. Many were just put in place without being bent up and secured, in case they needed to be removed for some reason. Many were. Man, there are a lot of them. I expect a Christmas card from the split pin manufacturer! Anyway, I'd spend 10 minutes doing them all, only to later find several I'd missed, then again an hour later, more I'd missed. This particular split pin shown below was a bit needy, as it would interfere with the ratchet pawl/lever on the luffing winch. That could be disastrous at the wrong time, so I was careful to finish it properly. And this is how it looks, really looks like a 969 now!! Soon, I'll have to attack a rear suspension problem. More on that later.